A splashing good time for the whole family. Zoo explorers of all ages can jump into the Wharton-Smith Tropical Splash Ground for a quick and easy way to beat the heat. The Wharton-Smith Tropical Splash Ground features streams, sprinklers and sprays creating a cool oasis inside the Central Florida Zoo. With water features including an octopus, lobster, sea turtle, raining trees and a bucket dump, it’s the perfect place for kids of all ages to splash around on those hot summer days. The Tropical Splash Ground is included in your regular Zoo admission. *Notice – While the Wharton-Smith Tropical Splash Ground is open all year, if the temperate is 60 degrees Fahrenheit or lower, the Splash Ground will be closed for the day. Additionally, the Splash Ground is closed when thunder and/or lightning is seen or heard in the vicinity of the Zoo. 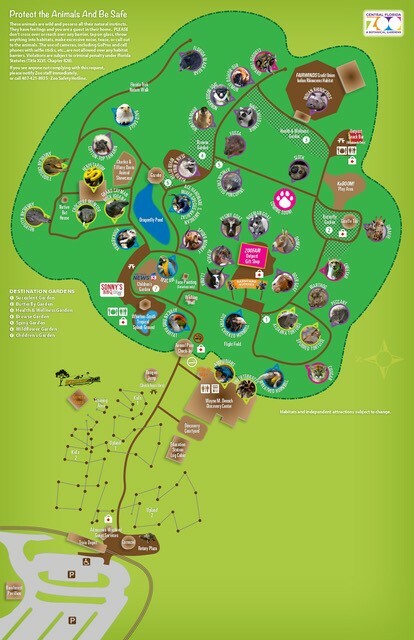 The Splash Ground will stay closed in such an event until thunder and/or lightning has not been seen or heard, by Zoo management, for a 30 minute time period.